I disagree. I’m no Navy SEAL like Mr. Gonzales, but this assertion fails my logical tests. 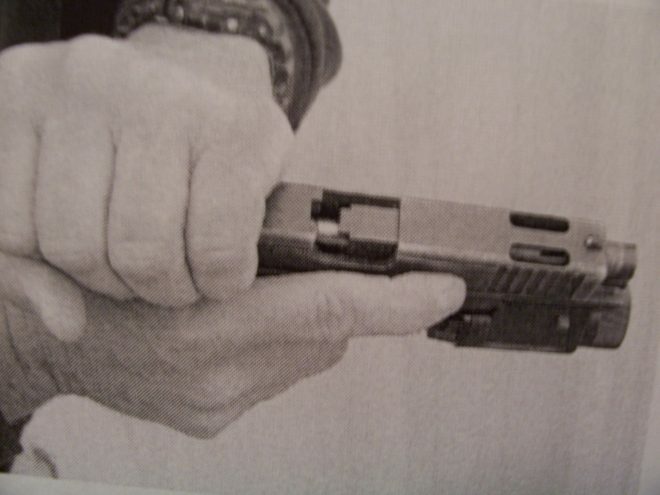 Unlike rifles where it is easy in an administrative situation to see the double-stack magazine change sides, most handguns are single-feed weapons and as such, it is near impossible to tell that the weapon is loaded without one of two things – a loaded chamber indicator (this is why I like them) or a press check. Press checks are ideal for administrative times – exactly when you are strapping a firearm to one’s body. In fact, administrative handling is the one time you should be handling a firearm unless drawing to fire or de-gun. Should one press check in the middle of combat? I would assert the situation dictates it – but it’s likely a hard no in almost all circumstances. But, in an admin function why would one not want to verify their readiness? More on this below. Now, I will say that Mr. Gonzales is quite right on his points on willingness, attitude, and readiness, but readiness includes having the weapon ready to perform and if one does not have a loaded chamber indicator – the only way to do that is to press check the gun. We want to perform a weapons check because we are learned and empowered to actually understand that malfunctions happen. I am checking to make sure that the most critical shot – my first one – has the highest chances of success. I instruct my students on the importance of handling themselves responsibly with loaded firearms as soon as they can handle their gun safely. There is absolutely no logical argument here. How is a press check not handling oneself responsibly so long as the firearms safety rules are followed? Then, to imply that BECAUSE one did the press check that they are going to draw a dead trigger is nuts. Do it right – ensure your weapon is in battery and in fact one of the key points of the earlier argument of readiness. This is a flat-out oxymoron. How can one assert that one should do “whatever it takes to be confident” yet throw out one of the processes that makes one confident? Personally, I have only press-checked at the range, prior to dry practice, or prior to starting a string in competition. Those few times where the possibility of actual combat have occurred (as with entering a previously locked building as a security guard, or my own home on a couple of occasions after finding the door ajar (yes, I know, I teach retreat to a safe location and call the PD, too!) I was too focused on clearing the area rather than checking to see if the pistol that was a moment prior in my holster was properly chambered! Taking such action seems to me to be unnecessary, and possibly dangerous. I guess I agree with the Seal.